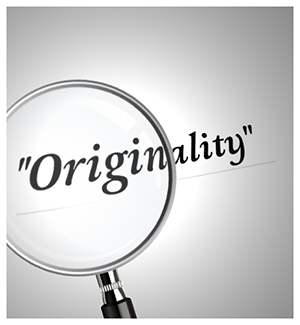 Originality is critical to your success. In article writing, it’s important to prove your originality and credibility in your articles with your own primary information. Although quotations are not entirely unheard of in articles, quotations can provide emphasis or support to your topic and your original ideas. If you decide to use quotes, don’t overdo it! Prove your status as an expert in your niche by limiting quotations to no more than 5 lines (total) of quoted material in an article and give credit where credit is due by properly citing your sources using these tips. You must be the original source of your articles. If we find content you’ve submitted matches content found elsewhere, we will search for your association with that content. No connection? We will have a serious problem. However, if you properly cite (or quote) content that is not original to you, then the quotes may help support your original ideas! Is it a Colon? Is it a Comma? No, it’s a Semicolon! 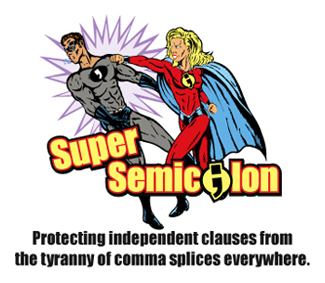 Do you feel inclined to join two independent clauses with – GASP – a comma? Stop the presses! This isn’t a job for a comma; this is a job for the semicolon. You may be thinking: “Why not just use a period?” When periods and commas can usually handle the job, the semicolon is overlooked. However, the semicolon can add a little style and clarity as well as offer a greater advantage when conveying balance or contrast. Discover how you can use the semicolon with these tips! 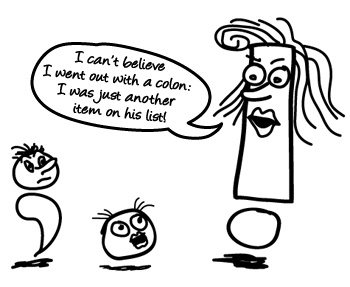 The colon is more commonly used to introduce a list, a quotation, or to explain the preceding part of the sentence. The colon is also used in declarations, proclamations, formal salutations, and more. It can be a fun little piece of punctuation, but most authors tend to steer clear of its formality and confusing usage by exchanging it for the period or the more exciting hyphen. Discover how this stout punctuation mark can add clarity and amplify your message when properly used with these tips! 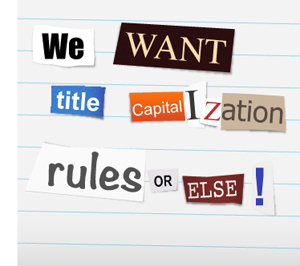 Do Your Titles Look Like a Ransom Note? To catch your reader’s attention, you want to do everything you can to ensure your article title is perfect. In fact, why not give it a little style? A little style, such as The Associate Press or Chicago, can go a long way in making your titles stand out. Also, using a style consistently will catch the eye of your readers and maintain your credibility. Martha finds inspiration in cooking her family and her dog. 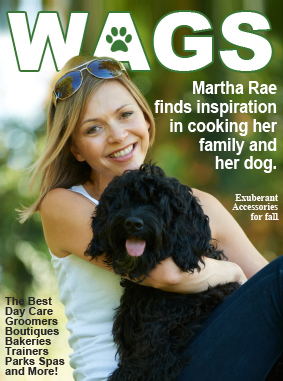 Martha finds inspiration in cooking, her family, and her dog. So many that we’re going to break it down to the most common grammatical errors involving the comma. Commas are used to separate elements in a series. Some authors choose to use the Oxford Comma (a.k.a. the serial comma) and some don’t. The argument for not using the Oxford Comma generally revolves around printed publications, like newspapers, to save on space. If your article has grammatical errors or spelling mistakes, it doesn’t matter if the content is original and valuable. If your readers (i.e. your audience, prospective publishers, and even your competitors) find an error, they will automatically focus on the mistake and your credibility will slip away. 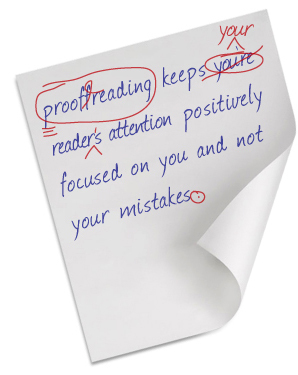 Proofreading is an incredible step to preserving your credibility and it keeps your reader’s attention positively focused on you, your original content, and your quality message. Brush Up: You may consider getting a grammar guide, subscribing to grammar newsletters, or even enrolling in an English Grammar course. Continue exploring the English language, discovering every nuance to improve your articles, and applying your findings in your articles. Similar to the many accents and dialects of the English language, there are many punctuation rules that vary from region to region. Many Expert Authors will follow a style guide, such as APA, Chicago, MLA, The Associate Press, etc. to ensure their writing is consistent and to uphold their credibility. You may choose a particular style based on your audience, your niche, etc. Whatever the style you use, make sure you are consistent throughout your articles. 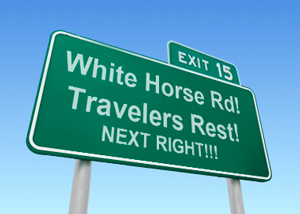 Which brings us to today’s top punctuation howler: The Apostrophe. 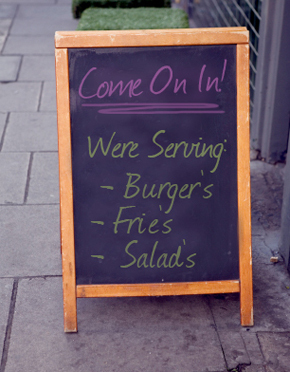 Have you ever walked past an eatery and cringed when you saw the daily menu: “Come on in! Were serving burger’s, frie’s, and salad’s”? Did it make you think: “Why would you tell me what you were serving? Or is a werewolf taking lunch orders? And what’s with the burger, the fry, and the salad? Are they fighting over possessing some mysterious object?” And then you might think it’s probably best not to go into that eatery for lunch. The bulletin behind the newscaster should have filled you in on the critical details, i.e. the burglar’s relative vicinity to you. 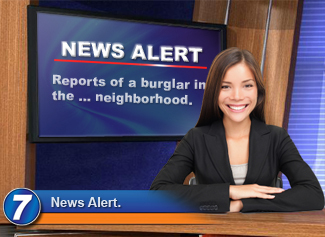 However, the “Reports of a burglar in the … neighborhood” is hardly informative and it’s undoubtedly nerve-wracking. Proper punctuation is critical to create a good user experience, as well as maintain your credibility and your message. This brings us to today’s top punctuation howler: the period, as well as its close relative the ellipsis. Top Punctuation Howlers – The Exclamation Point! Spelling, Misused Words, and Punctuation – Oh My! Next to more glamorous errors, like spelling mistakes and misused words, punctuation is often overlooked. Without punctuation, communication would be one long string of incoherent thoughts and ideas. 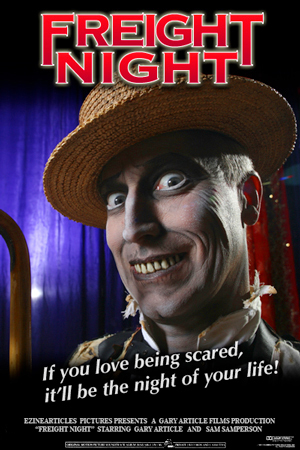 So come along with us as we kick off a new series with the excitable and occasionally overbearing exclamation point. Many will use the exclamation point (a.k.a. the exclamation mark) excessively and overdramatically. In these cases, readers question the author’s credibility as well as whether they can actually trust the author’s claims.